Halladay News … Maybe it is a Trick?? The past couple of weeks have been very humbling for me and the Toronto Blue Jay franchise. I’ve been tied down with late hours at work, and the Jays have virtually given up on the season after being belittled in the majority of 10 crucial games against the Yankees and Rays. I can’t really blame those losses on anything – it was just a good, old fashion beating we took from some very good clubs. The players that impressed me those series were Jeff Niemann of the Rays, who looks like a very good young pitcher with a live fastball and great slow curve and Hideki Matsui of the Yankees, who started out rough, but looks to be turning it on now. For the Blue Jays it is the same old story – we show glimpses of competing, but end up falling out of contention. Seen this before. The solution, for many in this circumstance, is to trade our best player with the shortest contract status. A solution that – to the dismay of most Jay fans – has not been taken advantage of in past years. Two years ago the Jays elected re-sign Vernon Wells when they had sureshot deal in place for Ervin Santana of the Angels. 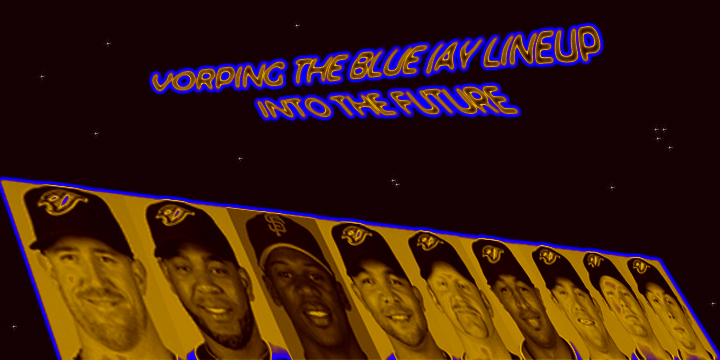 We also elected extend Alex Rios after a ‘flash in the pan’ 2007 season. 2007 saw Rios hit peak value, almost garnering a trade for 2008 NL Cy Young winner Tim Lincecum. To make a long story short, Rios has not nearly lived up to his performance in ’06 and ’07. He and Vernon Wells have combined to account for a ‘big waste’ in the Blue Jays payroll. Not to mention B.J. ‘freakin 15 Million for nothing’ Ryan!!!! But I disgress. Blue Jay fans I feel your frustration. I feel the pain, and I know how in this situation, a trade of Roy Halladay might be a solution. I can see that, but I do not agree with it. I strongly believe that this way of thinking is a ‘BIG MISTAKE’ for the club. We are just going to have to eat this one! Of the numberous wastes of payroll, mention previously, Halladay is not one of them. He won’t be one of them for a very longtime now. Halladay is a surefire Ace, and it is not like we can’t afford him? Halladay is money well spent. 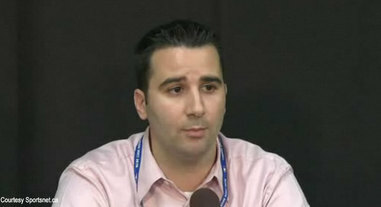 Trading Halladay would be punishment for the previous mistakes with Wells and Rios. It would seriously pain me to be stuck with them, and gone with Halladay. The pain would be overwhelming. Wells, Rios, Overbay and even Ryan (having to eat Ryan contract for next year) won’t come off our books for a while now. Yes, I understand the frustration. We are stuck with those guys for at least another 2 or 3 years. We have to eat it! Whatever pitcher we get in return for Halladay, will most certainly not be on Halladay’s level, and whatever hitter we aquire will probably take some time to pan out in the bigs. Halladay is a fan favorite, an amazingly well respected player and a guy with the heart of a champion. The Jays will lose fans over this, no doubt. If Roy actually asks for a trade, then that is another thing, but I think it would be a mistake not at least to try and invest in a player of his caliber. Talk about irony! A couple days before ‘the J.P. possibly shopping Halladay story’ broke, I personally made an investment in Halladay. A pretty big investment considering these circumstances. I bought a lifesized ‘Fathead’ wall poster of Halladay for my room. I know ladies, you love the room, lol. I was all about to post on here about how cool my room looks now until the news broke. Not so cool after this happened. What am I going to do with this if Halladay gets traded? It actually cost me over 100 bucks U.S. charged to my credit card. If I can make that kind of investment in a Jays player, the club should do the same! I’m a man torn between my love the Jays and my admiration for … who am I kidding? Love for Halladay! I’ve come to the conclusion that I will become a temporary fan of whatever team he gets traded to. ‘Doc’ will always be my favorite player of all time, and I will resent the Jays for trading him. How long? I don’t know? I can’t tell you all how upset I am over this whole situation. 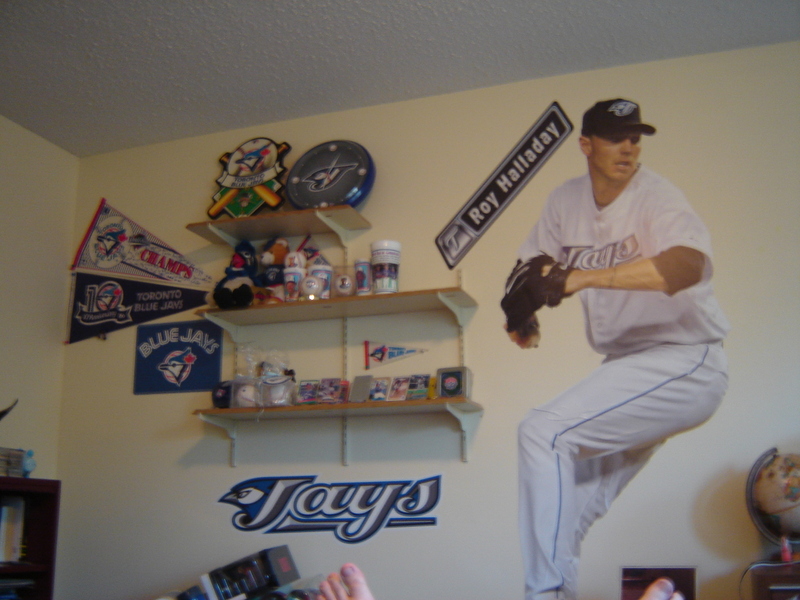 If Halladay gets traded, that enormous Fathead in my room will no doubt haunt and torture me for the rest of my life. Maybe I’m being a little too dramatic now, but I’m pretty upset! And the fact that this whole thing broke a couple days after I placed this poster on my wall!!! Really upsetting! Everything I love leaves that wall anyway. Are the Blue Jays purposefully trying hurt me as a fan? That is my question! We just tricked every contending team in MLB to annointing Halladay the best pitcher in baseball. Thank you for all those kind words. He is the greatest, we are glad we have him! I hope J.P. is pulling that trick, because that is what I would do if I were him! It would be a good consolation for the fans a struggling sub-.500 team. I got to go a game the other week and sit in the best seats I’ve ever sat in at a game. 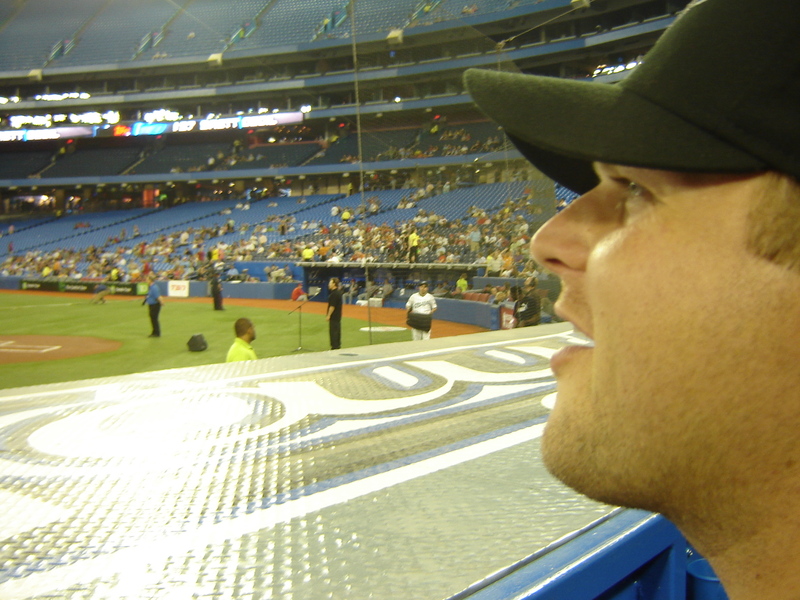 I was directly above the Jays dugout – few feet away from the team. My older brother Chris, where I get most of my baseball knowledge from, got a ball thrown to him from Blue Jay first base coach Dwanye Murphy. There he is (below) admiring our seats. The Jays ended up losing a hard fought game to the Cinnicinati Reds. Toronto native Joey Votto didn’t endear himself to Blue Jays fans going 4 for 5, with a homerun that night. Anyway, amazing seats! I felt like a king, and I ate great burrito after the game a place call Burrito Banditos on Blue Jay Way I believe. This is How We Chill! From 2003 Till …. Too much school right now! I’ve been writing essays about boring stuff, instead of blogging lately! It is actually hard for me to determine what is more productive? If I write this essay, I can get a degree? If I post on this blog, I will be happy? I wish baseball blogging, or writing, was a University program, lol!! Here is a taste of what I’ve been doing. CAUTION: You might burst into a deep sleep upon reading! constructing the individual as an autonomous unit of negotiation; constructing the workplace as a container for dispute resolution; establishing the industrial estate as a denationalized and desocialized space; constructing spaces of national sovereignty and imagined national/ethnic community; and, the distancing of homeplace from workplace through the use of migrant workforces. Enough of that!!!! Back to baseball!! 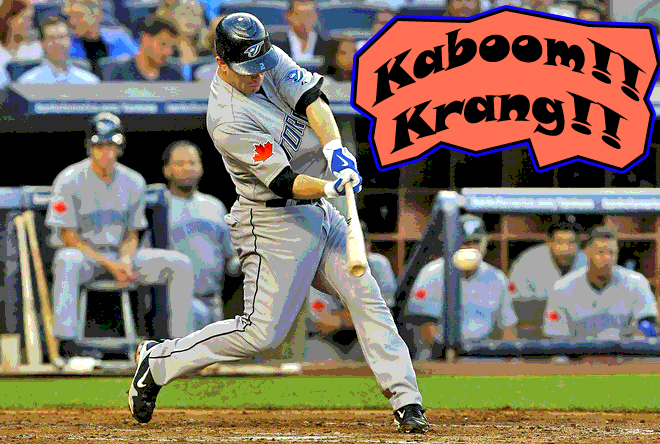 In this post, I wanted to dissect every MLB teams ‘staples,’ briefly since 2003. A ‘staple’, as known by many who take global political economy, is a single product that defines the economic standing of a region/country of the world. For instance, the ‘old south’ of the United States had ‘cotton’ as their staple, the Maritimes of Canada has ‘fish’, and Japan has ‘electronics’. I compare this to players on current MLB teams. Many teams have the same type of ‘staples,’ as players in their organzation. Although in past years, these players might not be the best players on their teams. In my opinion, many of them can be percieved to be accountable for a club’s success or failure. So lets take it back, and look at the players that have stuck with their clubs since 2003 until recently! Starting with … surprise! surprise! Almost no other team is as relevant to the 2003 ‘staple’ theory than the Blue Jays. The success of the Jays hinges on these players. The BIG word regarding them however is … INJURIES!!! It is hard to argue that these three players are NOT a strong nucleus to build a team around. Many will argee that these past years have seen the Jays go through a lot of bad luck with injuries, specifically regarding these staples! In 2005, Halladay was anchoring the Jays to a serious wild card run when Kevin (flippin) Mench smacked a ball of Halladay’s ankle ruining that year. Halladay has also had some arm trouble in past years. As far as Vernon Wells, I ask what year hasn’t he cause instability in the Jays lineup because of injury? He simply is our only legitimate threat in the lineup, and he is often either on the DL, or playing not because of injury. 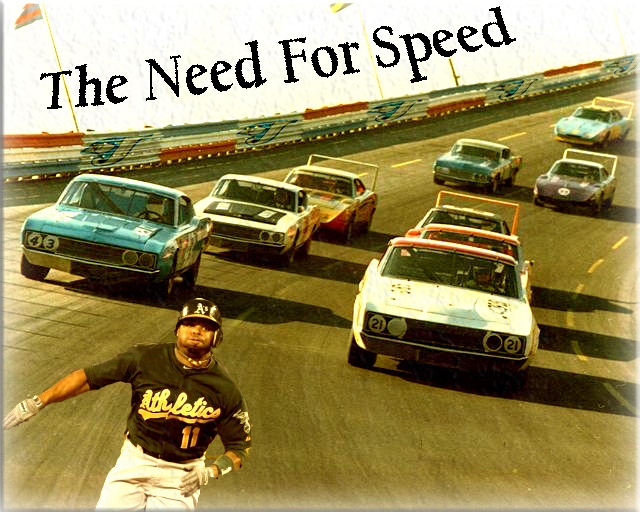 The Alex Rios project has seen it’s share of inconsistancies. The talent is there, but for some reason, you get the feeling we haven’t seen fully what he can do in a year. He can look like he is going to hit 40 HR’s then not hit one for 2 months? So case and point, the Jays have gone as these staples have gone. Very inconsistant, because of injury and what have you. Characteristics of a slightly better than mediocre team, which is what they have shown since 2003. Too much rambling on the Jays, sorry I couldn’t help it they are my team. Ortiz did not start the 2003 season with Boston, but he was definately an early turning point for the team that won in 2004. Manny and Ortiz are what made Boston so strong! They are staples in themselves, instilling fear in the middle of that order. Without them, no 2 World Series would have been won. I would argue that life without Manny will be different for Boston, however, they are in the process creating their own ‘staples’ now with Pedoria and Youkilus. Varitek and Wakefield have been steady contributors. They give the team an identity. Varitek has arguably been the best catcher in baseball from a leadership perspective, and Wakefield might not get amazing numbers, but having him in the rotation is always something that teams and hitters have to prepare for. These staples have made Boston achieve great success since 2003. Tek and Wakefield will continue to do this, as Boston transitions out of the Manny/Ortiz (might be showing decline with injury) years. I’ll try to make this shorter. CWS won the World Series in 2005. They did it with great pitching that year (particularly from Buehrle). They also did it with hitting the long ball! Konerko and Crede definately exemplify that philosophy! Those players produced a ‘staple’ of success for Chicago in that year, and also last year making the playoffs. The AL Central is a tightly competitive division, so it is hard for any team to see constant prolonged success in that race. 2003 was the year that these young players in Cleveland started to develop, and they did develop to guide the Indians into a 2007 playoff run (stopped by the Red Sox). Hafner has been hurt and inconsistant replacing Ellis Burks (old name) as the cleanup hitter in 2003, and Lee wasn’t that great until this year. These were strong and young ‘staples’ that helped Cleveland to a lot of success in 2007, and 2006 when they came close the playoffs. Losing Sabathia will hurt, however! All these players were backups, or in the bullpen in 2003. Detroit had to reinvent themselves, and that led them to the World Series in 2006. Like I said before, in many cases these ‘staples’ may not be a team’s ‘best players’. These players all had ‘career years’ in 2006, and were great for Detroit in the playoffs. Proving my point once again, as the ‘staples’ go, so does the success of the team. A lot of them, huh. Arguably, what has made the Yankees so successful over these years is the fact that they have these steady guys (staples) on the club! Before this season, 13 straight playoff appearances, but have fallen victim to other hot American League/National League clubs. However they do it, in 2003 they did it with Robin Ventura, Raul Mondesi and Nick Johnson also in the lineup, they do it! The look of the Yankees become quite different without the presence of many of these players. Hard to have a staple on a team that reinvents itself that much! In 2003, Mulder, Hudson and Zito were the strength of that team! Mark Ellis is a steady player at second base, but Chavez has been a big dissappointment for the A’s. They signed him, which is amazing for the A’s just in that fact, but it backfired as injuries have plagued him. I thought Chavez was going to be a very promising player for years to come, it looked that way. He fell off, the A’s fell off! Maybe Beane will never sign anyone to a big deal ever again! A great ‘staple’ to begin with, although he hasn’t been as amazing as he was in some years, Ichiro is the face of the Mariners. 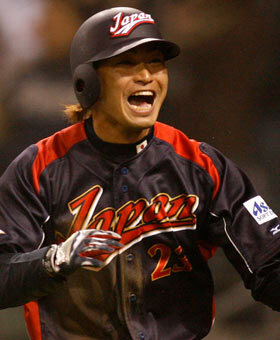 The point here is that it is only Ichiro! He needs the support of other ‘staple’ players, to help. Edgar Martinez was there in 2003, but he was far too old already. Brett Boone looked promising, but that was all drug induced. They haven’t had solid players that they could fill positions with and call ‘staples’ in years! ‘Staples’ are what characterize the Mariners lack of success in this case. They were the Devil Rays in 2003, so I can call them that. Crawford is an absolutely electric player on the field! Signing him to a big deal was definately the right call, and as soon as the Rays got a better supporting cast around him, they succeed. Baldelli’s injury plagued career has set the Rays back in past years. The Rays drafting with the 1st pick, has made them able to develop new ‘staples’ that they NEED to hold onto in order to succeed further. Crawford was, by far, a standout player for years before 2009. Pretty difficult when the only solid staple on your pitching staff, is not solid or a staple at all. The Rangers can always hit and score runs, Michael Young has definately been a big part of that, but the pitching is terrible. 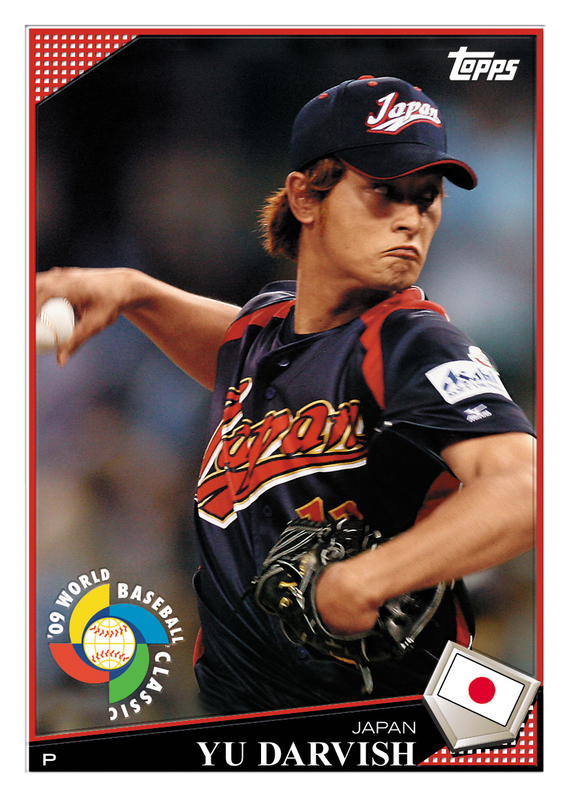 Chan Ho Park was their ACE in 2003. Blalock looked promising, but injuries have kept him from doing anything great. The Rangers were very troubled in the years leading up to now, their ‘staples’ were not sufficent and lacking in talent, especially in the pitching staff. 2003 was Morneau’s first year, and while he, Tori Hunter and Johan Santana were the ‘staples’ of some Twins’ playoff teams, they find themselves in the situation of having to be more cost efficient. Morneau will keep the Twins competitive in the AL Central, as they have been, but the Central is usually a toss up every year, as to who will win? Can’t argue with the Twins, they usually play great baseball every year and are in the hunt, too bad the playoffs haven’t been kind to them! “At least they make the playoffs,” says a disgruntled Blue Jay fan! Kansas City Royals 2003 – Absolutely Nobody! I really feel for the Royals, always having to reinvent themselves. 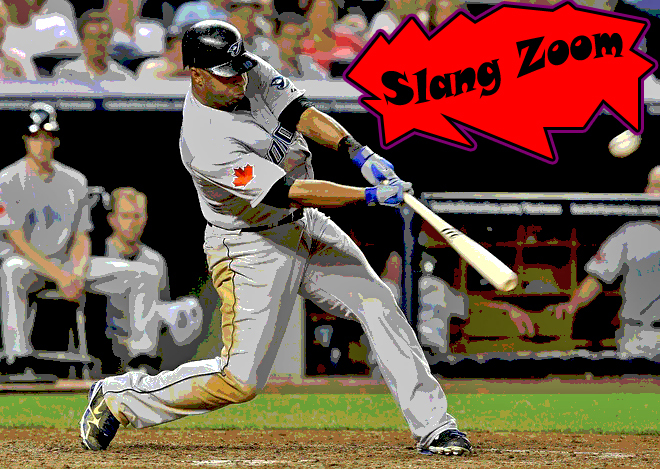 In 2003, the Royals had Carlos Beltran, key word HAD. But even if they resigned him to be a staple, would they be any good? Probably not, is the sad answer. This is their rotation in 2003! Haven’t even heard, or remember, the last two guys. Sadly, those type of players have become their ‘staples’. All these players were not in the O’s starting lineup/rotation in 2003, they were just developing. Roberts is a fine player, but the others are simply mediocre. Again, their problem exist with the pitching staff, which is very inconsistant and does not have a significant ‘staple’. They’ve been a very mediocre club and so have their ‘staples’. You can’t tell too much looking into their ‘staples’. Sidenote: ex-Blue Jays Cy Young Pat Hentgen was on the Orioles in 2003, along with other ex-Jays David Segui and Tony Batista. After the year the Angels won the World Series, they only have four players remaining from that era today. An excellent vetern hitter, two guys that have anchored what is arguably the best bullpen in baseball year in and year out and a very solid starting pitcher. Since 2003, the Angels have done a lot of tinkering around these guys, like adding Vlad and getting rid of Eckstien, Glaus and Erstad. However, the strength of the Angels has always been their bullpen, and you can’t think of a more solid hitter for the team, than Garret Anderson! All these guys were staples of some very good Angel clubs, that often were featured in the playoffs. Agree? Disagree with the 2003 staple theory? The NL next post! Phillip Kelly, “Spaces of Labour Control: Comparative Perspectives from Southeast Asia,” Transactions of the Institute of British Geographers 27 no. 4 (2002): 398. What a Catch! Game 4 Jays/Tigers Detroit Trip. One of top five Jays highlights of 2008 came in the game that I attended at Comerica Park on Thursday. The catch that Vernon Wells made on a Curtis Granderson for sure triple, in the bottom of the 9th of the Tigers/Jays game on Thursday, was amazing. Watching from the stands, I thought no way he was getting to that ball. Vernon truly is a gold glove, in every sense of the word. I only wish he could have a stronger body and stay injury free, because he can really be a force in our outfield and our lineup. If you look at the numbers, we rely so Vernon Wells to carry this team. When he doesn’t play well we lose and when he plays great and we win. It is a tough burden for Wells, but its a fact, ‘the Jays will go nowhere if you can’t stay healthy’ sorry. It was a great catch and it got me really excited at the ballpark, so much so, I stood up with my Vernon Wells jersey and pointed to the name/number on the back of it, to rub it into the Detroit fans. To my shegrin, the rest of that 8th inning did not go so well. The Jays gave up their 1-0 lead and ended up losing 5-1. Despite the score, me and girlfriend had a great time at Comerica Park. Lots to do there, it is like an amusment park, the food made me very happy. Check out the picture package! It is full of beer, nachos, burritos, daquiris and legendary Tigers. While I was in near by, Windsor, Ontario, I also checked out the Underground Railroad momument. A pretty neat piece of Canadian History.